The results are in and DCU SU’s next sabbatical team have been elected with Kim Sweeney, James Donoghue and Domhnaill Harkin all emerging victorious. Hundreds of students filed into an extremely heated Nubar to hear Returning Officer Steve Conlon announce the results. Kim Sweeney was elected the Students’ Union President 2015/16. Sweeney, a final year Analytical Science student, received 1479 votes beating candiates:Sean Cassidy who received 1029 votes with Timmy Crowe receiving 441. Results for #CVElections President – Valid 2949. Cassidy 1029 Crowe 441 Sweeney 1479. Sweeney Elected SU President. Meanwhile the race for Vice President for Education was decided by just 64 votes. 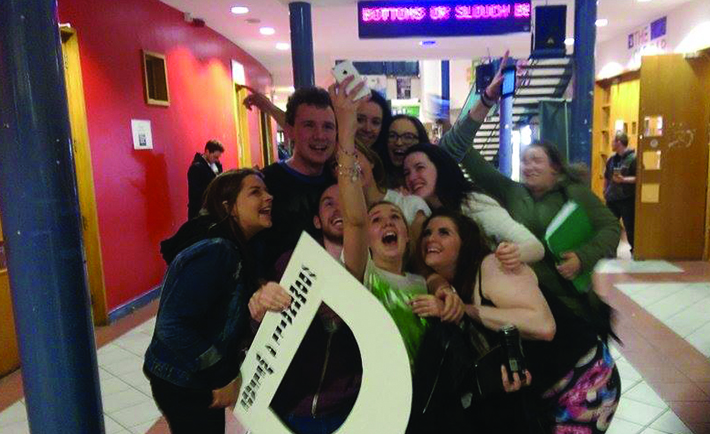 Final year journalism student James Donoghue emerged triumphant over Jack Butterly, Iarly Carty and Jake Ryan. Carty was the first candidate to be eliminated after receiving 412 first preference votes. Ryan soon followed after he received 657 following the second count. A thunderous roar was heard across Nubar following the announcement that Donoghue will be DCU SU’s next Vice President for Education as he beat Butterly by 1,401 to 1,337 votes respectively. Results for Education: a third count: Butterly: 1337 Donoghue: 1401 votes. Donoghue deemed elected. Speaking to The College View shortly after his win, the Wexford native also applauded his fellow candidates for their comradery. Domhnaill Harkin emerged victorious in a close race for the Welfare office. He garnered 1,013 votes following the elimination of Katie Drea, Gillian Mcinerney, Ciara O’Dwyer and Katie McGoey respectively. In a close stand off, Harkin was deemed elected following the fourth count with a final tally of 1,013. Flanagan’s final count was 830. Speaking to The College View shortly after the count, Harkin put the success down to his active campaign team. “I’m absolutely delighted. I really did not think I was going to get it. I wouldn’t be here if it wasn’t for my team. They were so supportive. I wouldn’t have went for election if it wasn’t for them,” he said. Harkin also commended his fellow candidates on the fair campaign. That’s a wrap for this year’s election race. With 14 candidates competing for three positions, endless interviews, debates and viral campaign videos, The College View would like to congratulate the newly elected officers and wish them the best for next year. Finnian Curran and Katie O’Neill.